Which Vitamins Do What for Your Body? Home > Essential Steps to Good Nutrition > Which Vitamins Do What for Your Body? There are certain essential vitamins that our bodies need in order to grow and develop normally. 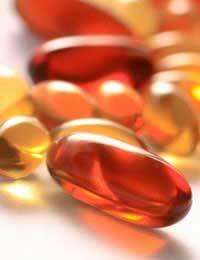 In some cases, where a person develops a deficiency, for instance, supplements may be required for optimum health. But by far the best way to get enough vitamins is to eat a balanced diet with a variety of foods. How is your knowledge of vitamins and what they do for your body? Can you Name the Vitamin? 1. This vitamin assists the body in breaking down carbohydrates, proteins and fats. It maintains healthy arteries and lowers cholesterol, promoting healthy blood flow. It is found in green vegetables, turnips, potatoes, asparagus, mushrooms, peaches, watermelon and bananas among other fruits and vegetables. 2. Helping us fight the effects of free radicals, this vitamin is a powerful antioxidant. It produces collagen, assists in delaying the ageing processes and helps the body repair tissues quickly. Among many other benefits, this vitamin assists in the production of red blood cells and haemoglobin. It is found in oranges, limes, strawberries, apples, sweet and hot peppers, onions and spinach and many other foods. 3. This important vitamin is crucial for the development and maintenance of strong teeth and bones, good vision and healthy skin. It works with Carotenes which help the body protect itself from damaging free radicals. It enhances the body's immune system, lowers cholesterol levels and assists with hormone production. Often known as the anti-ageing vitamin, it can be found in a wide variety of fruits and vegetables, including kiwifruit, nectarines, blackberries, broccoli, carrots, green and red peppers and tomatoes. 4. This is a member of an important group of vitamins with a vital role in providing our bodies with energy. It helps to keep our nervous and cardiovascular systems functioning healthily and it produces adenosine triphosphate, the body's major source of fuel. Important sources of this vitamin include kidney beans, navy beans, peas, avocado, orange juice and raisins. 5. Your body can make this vitamin, which assists the body to absorb calcium, keeping bones healthy and strong. It reduces the risk of developing osteoporosis and joint damage and is believed to slow down the symptoms of arthritis. It is found in mushrooms, but not naturally in fruit. You can buy orange juice fortified with this vitamin. 6. This vitamin plays a role in the body's ability to repair damaged tissues and also assists in the production of the neurotransmitter, serotonin - which regulates our sleep, mood and appetite. It is recommended for women planning to conceive for its role in preventing the foetus developing spinal conditions. It also aids digestion and may protect against cervical cancer. Find it in green leafy vegetables such as spinach and asparagus, legumes, sweet potato, carrots, citrus fruits, kiwifruit, strawberries and bananas. 7. The benefits of this vitamin include lowering cholesterol levels, boosting the immune system and assisting the healthy development of muscles. Importantly, it works as an antioxidant and helps slow down the ageing process. It is believed to help prevent prostate and some other types of cancer. It is found in sweet potatoes, mangoes, apples, bananas, kiwifruit, blackberries, broccoli, corn and avocados among other foods. 8. Benefits of this important group vitamin include helping with the symptoms of stress and anxiety. It converts carbohydrates, fats and proteins into energy and stimulates the adrenal glands and vital adrenal hormones. It increases stamina and energy and the production of essential antibodies. It is found in peas, legumes, cauliflower, avocado, bananas, oranges, mushrooms and many other fruits and vegetables. It is not difficult to see, looking at these important vitamins, that a whole range of fruits and vegetables feature time and again as the best sources of incorporating them into our diets. Eating a varied diet of all kinds of fruits and vegetables, ideally covering all the colours from greens to yellows, oranges to reds, will ensure a plentiful supply of the essential vitamins detailed here and many more besides. More delicious and satisfying than 'popping a pill', and with the obvious benefits to our bodies and health of consuming a healthy, wholesome diet, eating more fruits and vegetables is the surest way of getting all the vitamins we need. Even someone insisting they don't like vegetables and are not fond of fruit, would find it difficult not to introduce even a few into their diet from the dozens offering such a rich bonus of vitamins. 1. Vitamin B3 (Niacin); 2. Vitamin C; 3. Vitamin A; 4. Vitamin B1 (Thiamin); 5. Vitamin D; 6. Vitamin B9 (Folate/Folic Acid); 7. Vitamin E; 8. Vitamin B5 (Pantothenic Acid).